The Port of Kalundborg is one of the few deepwater ports in Denmark. It’s situated at the western end of Zealand, a convenient distance from Copenhagen. In recent years, the port has undergone a range of positive developments, culminating in an expansion of the overall area. Kalundborg also has an industrial cluster, which is dominated by companies in the medical and chemical industries. Novo Nordisk has, for instance, based the world’s largest insulin factory in Kalundborg, and Novozymes produces enzymes for, among other things, detergents in the area. 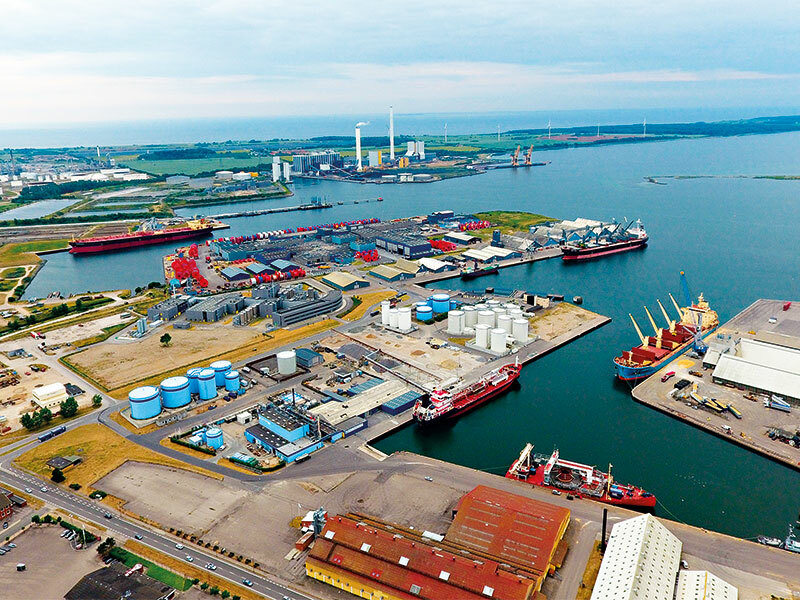 Furthermore, as well as the industrial cluster and a location with an hour’s drive of Copenhagen, Kalundborg is perfectly suited to recent developments in shipbuilding. As new ships become bigger and bigger, they need a port with greater water depth – that goes for container ships as well as cruise ships and yachts. With a water depth of 15 metres, the Port of Kalundborg can accommodate even the most up-to-date models. Today, the port encompasses approximately 800,000 sq metres, all of which is occupied. For this reason, authorities have decided to expand the overall port area by 330,000 sq metres. The new area, which is called the New West Port, will have a 500 metre quay, and the water depth will remain at the aforementioned 15 metres. The port has the advantage of being the only port in Zealand to offer a 15 metre water depth. Moreover, it is located right by the T-route, which is the deepwater route connecting the Baltic and North Seas. With this in mind, we hope to attract yet another manufacturing company to the New West Port, possibly within the medical or chemical industries with which Kalundborg already has such strong links. Back in 2008, the Port of Kalundborg started work in a whole new business area, which has since attracted a lot of activity. In connection with the construction of Pronova BioPharma’s new factory, the port began to establish a tank terminal, where the company could store the fish oil needed for its products. Today, we rent out tank capacity for chemical companies such as BASF, Haldor Topsoe and Avista Oil. The tank terminal has grown continually since it was established, and has become one of the port’s main business areas. We expect to install further tank capacity at the New West Port. Another business area at the New West Port will be our container terminal, which also needs more space to grow. The container terminal has connections to the main container hubs in northern Europe – Hamburg and Bremerhaven – as well as connections to the UK, Poland, Finland and the Baltic states. There is, however, still a lot of space at the New West Port for companies that need production or storage facilities with deepwater access. The Port of Kalundborg is prepared for the future, and construction is due to begin later this year, to be finished by February 2019.